After a brief hiatus late in 2008, the 3 original members of Human Fortress began planning the resurrection of the band for what would be their fourth studio release. Todd Wolf (guitars), Volker Trost (guitars), & Apostolos Zaios (drums), were joined by Dirk Liehm (keyboards), Andre Hort (bass) and Gus Monsanto (vocals). What has resulted is a record full of rich tales of bravery, medieval battles and chivalry. The lyrics take you away to a bygone day where the maidens are fair and knights fight noble battles, some victorious and some tragic. The musical style reflects the lyrical content, in tracks such as ‘Wasted Years’ & ‘Restless Souls’ the folk influences show through in the intros and melodies, which mix perfectly well the hard rock guitars and driving rhythm section. Monsanto’s vocals soar and his delivery adds grandness to the overall feel of the album. After a brief orchestral intro ‘Evil Curse’ comes to life with a dark menacing guitar riff, that just sums up the track, and along with the powerful ‘Wasted Years’ make these to my ears the stand-out tracks on the album. On first listen it is clear that some of the chord changes and melodies will sound familiar to fans of Kamelot, but the folk influences add a nice dimension and Monsanto is a real vocal talent who hits every note with real conviction. 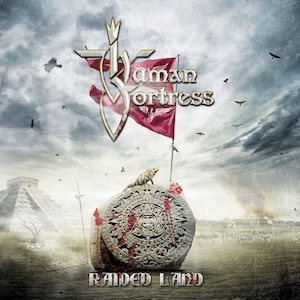 Mixed and produced by Seeb Levermann (of the excellent Orden Ogan), ‘Raided Land’ oozes with huge melodic choruses and is indeed epic in it’s ambition, so if you’re in need of a classic sounding metal album that evokes images of ‘olde worlde’ battles and chivalrous knights, this delivers in bucketloads. After a number of years learning the ropes with local newspaper photographers, shooting gigs, sports events and school photography, I took the plunge in March 2012 and branched out to begin LIVE:i photographic agency, with the aim of providing quality event and commercial photography for a range of clients.